Schedule of Events for Thursday, May 23, through Sunday, May 26. 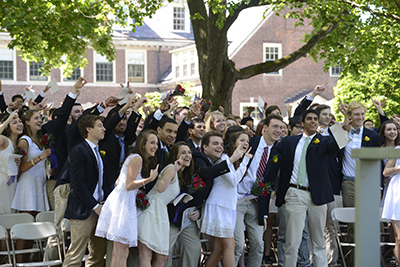 Senior Lunch — Saturday, May 25, 12 noon—1 p.m.
Commencement Rehearsal — Saturday, May 25, 1—2:15 p.m.
Commencement is scheduled for 10 a.m. on Sunday, May 26, and will be held on the lawns of Loomis Homestead and the Head's House, in the area directly in front of Founders Hall. The ceremony will last approximately two hours and will be followed by a buffet luncheon. Tickets are not required for Commencement and there is no limit on the number of guests per graduate. Rain location for Commencement is under the tent in the Grubbs Quadrangle. In the case of inclement weather, covered seating during the ceremony is limited. Under these circumstances, guests are encouraged to provide preferred seating to parents and grandparents of graduates and others to bring appropriate rain gear. Commencement announcements were available for seniors to pick up prior to March break. Boarders received them in their mailboxes, and day students were asked to pick them up at the Deans Office. Each senior received five announcements, which may be used to invite or announce the graduation to family and friends. An announcement has been mailed to each senior parent as well. Graduates generally wear white or off-white dresses, or navy blazers, ties and light slacks. While Class Night ceremonies are less formal, appropriate dress is also encouraged for this event. Several area hotels offer special rates for guests attending Loomis Chaffee Commencement. Check the Commencement accommodations page for details and links to make reservations through Loomis Chaffee room blocks. Please note the cut-off dates for reserving rooms at discounted rates. During the ceremony, photographs will be taken of each graduate receiving his or her diploma from the Head of School. Review information from Island Photo. A panoramic shot of the class will be taken as well by Panfoto. We ask that parents refrain from bringing celebratory cigars, champagne, or other alcoholic beverages. Please note that Loomis Chaffee is a smoke-free campus.